Looking for a virtual pet? Search no more because TALKING PANDA IS ALL YOU NEED. My Talking Panda – Virtual Pet takes talking animals and virtual animal games to a whole other level. Adopt baby panda ASAP and spend Christmas holidays playing with your baby panda! This Xmas, treat yourself to an adorable virtual pet! Getting a talking parrot, talking cat or a talking dog is exciting, but talking panda is something completely different. This virtual pet will have you spinning around and jumping with joy once you check out all its features. 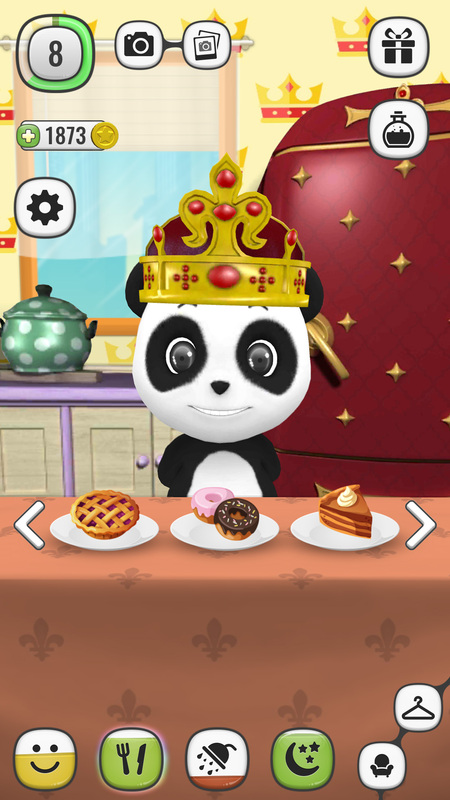 Talking panda makes playing dress up games a lot more fun as now not only can you change clothes, fur and other accessories for your virtual pet, but also furniture and appliances to make them fit better with the outfit. Also, you can get your baby panda ready for Christmas and New Year’s by choosing awesome holiday outfits. How cool is that?! Talking animals have become such popular games for girls and boys so this panda game is an awesome addition to the bunch! ★ Play mini games with your virtual pet. NOTE: You can play this talking game and collect points in order to advance to higher levels. Once you’ve moved several levels up, you will get fun gifts to help you in the game. Finally, all the rooms have energy levels that need to be charged after some time by playing with the cute baby panda and taking care of him. As a virtual pet, MO is very cautious about his health so he brushes his teeth and exercises. You can also make the panda jump and sweat so that he stays nice and healthy. Or, you can watch him practice his few kung fu moves because this panda bear looks up to his famous cousin. Good news is that when MO works out, the room energy levels increase faster, thus enabling you to play longer with your virtual pet. Talking animals, like talking parrot, talking dog or a talking cat keep children entertained, but they also teach them how to take care of another living being. As a result, virtual animal games is not only fun, but also educational to an extent. 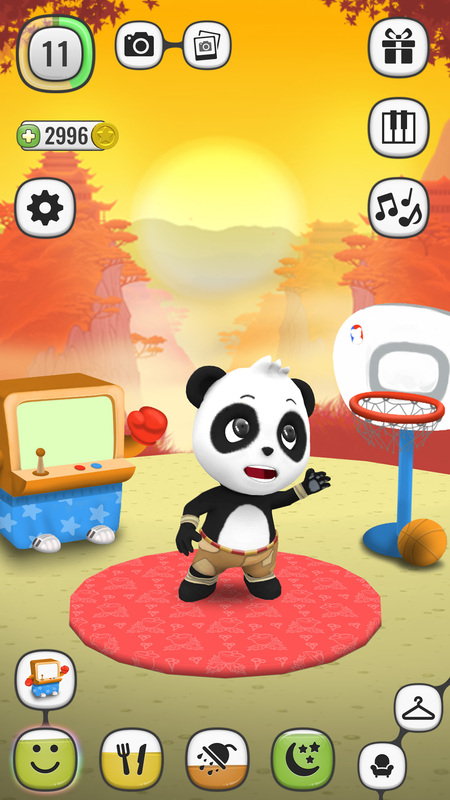 Once you download My Talking Panda – Virtual Pet, you will get a goofy talking panda who will make your day with his awesome features. With MO, talking pets have become more interesting and games for girls and boys a little more entertaining. Spend Christmas and New Year holidays playing with your favorite virtual pet! Make your panda run and get as much food as you can while trying to stay alive for as long as you can. Fly your baby panda as a bird and make sure he gets around all the obstacles. Play the game of X’s and O’s and make sure you get three of the same sign first or you will lose. Feed the monkeys with bananas and test your reflexes. Play this retro game and see how long you can last before your tail becomes your dinner. Panda games can be a lot of fun, especially when you’re playing them with such an adorable baby panda. If you are eager to play some virtual animal games, MO will be there waiting. Virtual pets are great games for girls and boys as they teach children some responsibility in addition to being fun and entertaining. 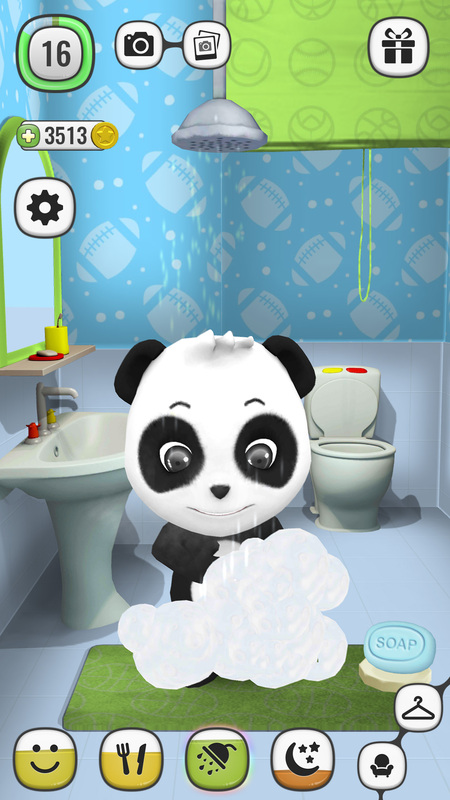 Download My Talking Panda – Virtual Pet and enjoy playing with your talking panda! Mo wishes you Merry Christmas and Happy New Year!